11:28 Raven262 Hah, exactly 30 seconds. 11:28 Raven262 Well, its a kind of a holiday here, so pretty nice. Hows things over there? 11:30 Raven262 I had to go to the church this morning. Not terribly early, but it was kind of snowing here too. 11:31 Raven262 Yeah, I've heard about some scary storms in the western Europe. 11:31 Raven262 So we are probably on the edges of that. 11:35 shivajiva ten what licence are the textures in mobs redo? 11:53 nerzhul Krock, can you finish your review on red-001 pr mentioned in -dev ? 11:53 Krock nerzhul, the basic hud/both? 12:51 red-001 did it crash after 40 hours? 12:52 tenplus1 wait, is 0.4.17 official already ? 13:18 tenplus1 kewl, what features is it lacking ? 13:22 paramat please can someone open an issue for shift-Q in 0.4.17? 13:55 paramat tenplus1 what version of MTG seems to have a busier flower spread ABM, latest master? what flower changes do you mean? 13:57 paramat "Note ABM interval and chance are set for testing." 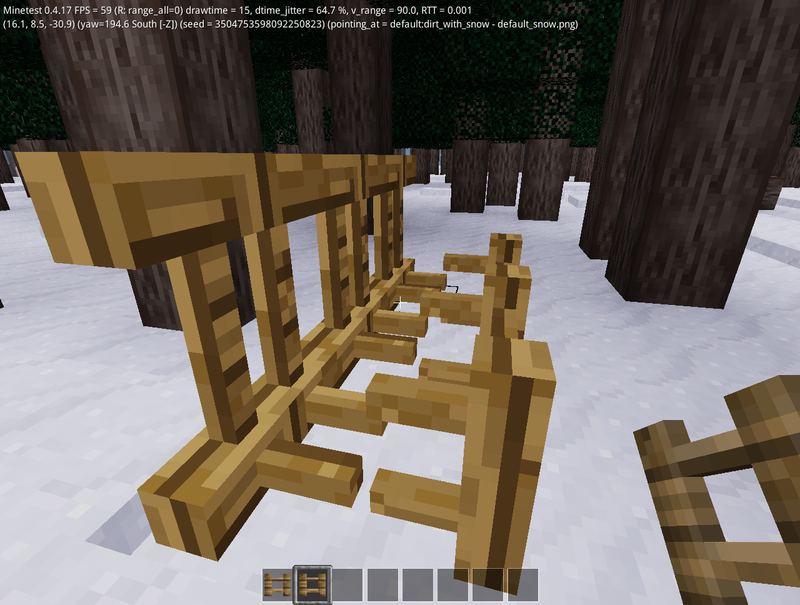 14:02 paramat has anyone seen these bugs https://github.com/minetest/minetest_game/issues/1952 "Visual glitch between the two halves of fancy beds"
14:02 tenplus1 never noticed... mind you, is there any chance of merging beds into 1 node like we did with doors ? 14:15 IhrFussel Couldn't doors theoretically be just 1 large node that rotates its axis to indicate open/closed state? 14:17 tenplus1 wait, it doesnt do that already ? 14:17 tenplus1 is it 2 different states for open.close ? 14:18 tenplus1 dont they flip when 2 are placed together, so 1 normal node, 1 flipped ? 14:19 ThomasMonroe ten, what do you think of #6931? 14:20 tenplus1 interesting to know but doesnt minetest server webpage show total player online ? 14:20 tenplus1 do we need this for main menu ? 14:26 tenplus1 yeah, but how many nodes are registered per door ? 14:32 tenplus1 is 65535 the total number of nodes that can be registered ? 14:33 Megaf I really dislike this "attempt to call method 'is_empty' (a nil value)"
14:33 Megaf can't the engine just let it go and keep going? 14:33 tenplus1 inventory check ? 14:33 tenplus1 Krock: explain please ? 14:38 tenplus1 does 0.4.17 have all the new stuff like ferns, map, binoculars etc ? 14:38 tenplus1 or jsut fixes ? 14:57 Shara You okay with me using that texture, at least for now? 15:09 tenplus1 arent ferns simple flowers using spread function ? 15:15 IhrFussel Wait...I should open that issue in the backport branch right? 15:15 IhrFussel Or is it the same? 15:26 Megaf paramat: can't I just update the engine? 15:37 paramat which issue is best for requesting fixes for addition to 0.4.17? 15:55 paramat you're using 0.4.17? 16:50 tenplus1 what's taht for ? 16:54 tenplus1 what does it actually do ? 17:23 Raven262 How hard would it be to create fences that can be rotated on Y axis? 17:23 Raven262 And to connect to each other, of course. 17:24 Raven262 Yeah, I thought it could be done as an engine change. 17:25 Raven262 I see. It is all stored in one nodebox def. 17:27 Raven262 Well, another node can be registered for this. 17:28 Raven262 I saw it. 17:28 Raven262 It can be done easily. 17:28 Raven262 I shall try to do this. 17:29 tenplus1 what you adding ? 17:30 Raven262 Just testing for now, if it proves as easy as it looks, I shall make default fences. 17:32 Raven262 Huh? I never thought of that. 17:34 Raven262 I just found that nodeboxeditor will be of little use here. 17:46 Raven262 Now, whats front, left, back, right? WHY DON'T PEOPLE USE axis names, please? 17:47 Raven262 Btw, node box editor is nice for this. 17:50 Raven262 Yeah they are. 17:50 Raven262 I even made one myself. 17:52 Raven262 I tried learning some basics of the blender, it went pretty nice. I could make nice skyboxes and stuff. 17:53 Raven262 And after a month i forgot it all. 17:53 Raven262 So, yea I hate that. 17:55 IhrFussel Is blender used by professionals by the way? Or is it more for private use? 17:56 IhrFussel Okay but big game devs likely use something else to create their game models? 17:59 IhrFussel Maybe I should reword my question: can you create with my blender models that are from this gen? 18:09 Calinou <IhrFussel> Okay but big game devs likely use something else to create their game models? 18:10 tenplus1 "Some of the most popular are Blender, Autodesk 3ds Max, FreeCAD, Cinema 4D and Autodesk Maya. During aÂ gameÂ development internship I had, my supervisorusedÂ Blender (I'm pretty sure)"
18:21 Raven262 tenplus1, Okay, I'm currently fixing the nodebox. 18:38 Calinou "Microsoft Announces Minecraft 2 Will Be Modeled Using NodeBoxEditor"
19:26 Fixer tenplus1: is it possible not to render those collision boxes around mobs_redo? 19:29 Fixer tenplus1: but is it possible to moders to hide this for their mobs for example? 20:01 ThomasMonroe not do nuthin? 20:01 ThomasMonroe which means it does somethin'? 20:08 Fixer VanessaE: how it is called? 20:08 VanessaE Fixer: "creative building"..and I'm going on just fine. 20:09 VanessaE so it isn't announcing? 20:09 VanessaE or the master list isn't reflecting that it is, in fact, announcing. 20:13 VanessaE sfan5: check the server's logs? 20:19 ThomasMonroe paramat is there any real use for the Mods tab? 20:20 ThomasMonroe just curious because I have never used it. 20:24 ThomasMonroe what about the GUI that pops up when you click the configure button for creating a new world? 21:18 Fixer Calinou: in q1? 21:51 Calinou >Secret Area! You Crazy Rocket Jumpers! 22:02 red-001 nerzhul, could we remove the on_connect API? 22:04 nerzhul can you provide a PR ? 22:13 red-001 wayward1, huh is that your own i-line? 22:17 nerzhul sfan5, Calinou, is this good for you now ? 22:22 nerzhul sofar, is this an approval on the red-001 PR ? 22:23 nerzhul sfan5, can you take a time toe change your approval on #6072 ? 22:24 nerzhul sofar, can you look at #6936 to see if it's good for you ? 22:25 shivajiva anyone explain why everyone in skyblock has shrunk? 22:27 red-001 is that a channel for somehow overlaying logs with voice recordings? 23:48 red-001 that a brazillian channel? 23:55 Megaf Why nobody at #Minetest-Chat ? 23:57 Megaf more people to join there to talk off topic? 23:58 Megaf Calinou: care to OffTopic with us too?